The turnover of household vehicles has slowed since 2009, based on U.S. Department of Transportation surveys of household vehicle travel. The 2017 National Household Travel Survey (NHTS) reported that households held on to their cars, trucks, and vans longer. The average vehicle age has increased from 9.3 years in 2009 to 10.5 years in 2017, suggesting that many households have delayed the purchase of a new vehicle and continuing a trend of U.S. households operating vehicles longer. The aging of U.S. household vehicles was reported across all light-duty vehicle types, in particular for pickup trucks, vans, and sport utility vehicles. By comparison, the average age of in-use cars increased, in absolute terms, from 9.5 years in 2009 to 10.3 years in 2017. 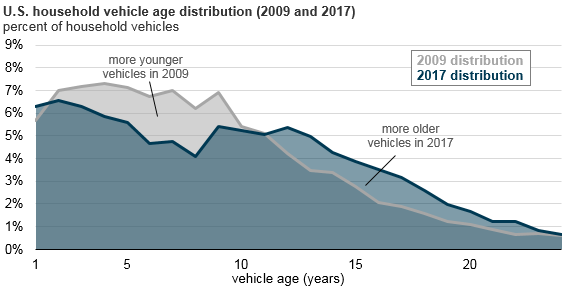 The increases in average age between 2009 and 2017 ranged from a low of 0.4 years for other light trucks to a high of 2.4 years for pickup trucks. The slowing of vehicle turnover has implications for transportation fuel consumption, because newer vehicles tend to have better fuel economies. Households with lower incomes tend to have older vehicles than households with higher incomes, but since 2009, that gap has slightly narrowed. The average age of vehicles used by higher-income households has increased more than those used by lower-income households. Overall, the aging of the vehicle fleet suggests many households have delayed purchasing a new vehicle or have instead purchased a used vehicle. Data from the Bureau of Labor Statistics’ Consumer Expenditures Survey show that spending on vehicle repair and maintenance has also increased in recent years. Even as vehicle turnover has slowed, the U.S. Environmental Protection Agency reports that fuel economy has continued to increase because of technology advances adopted across all vehicle types of new light-duty vehicles. Average and aggregate energy use by vehicles, however, also is affected by travel demand and characteristic data not incorporated in vehicle-age statistics, such as variations among household vehicle ownership and use. The NHTS has been conducted by the U.S. Department of Transportation's Federal Highway Administration eight times since 1969. The 2009 survey was conducted before the federal Car Allowance Rebate System—which accelerated new vehicle purchases in July and August 2009—had started.